Your home is your biggest investment and it is important to protect it now and for years to come. If you are having problems with your current water system like leaks, high water bills, low water pressure, rusty or bad tasting water, It is important to call an experienced repipe expert right away! If left unattended, small leaks can lead to bigger problems and costly repairs due to water damage which can destroy flooring and damage walls and even cause health issues if mold & mildew develop. For the Lifetime of your home under normal conditions of use, we will repair or replace copper/PEX potable water pipes and fittings. 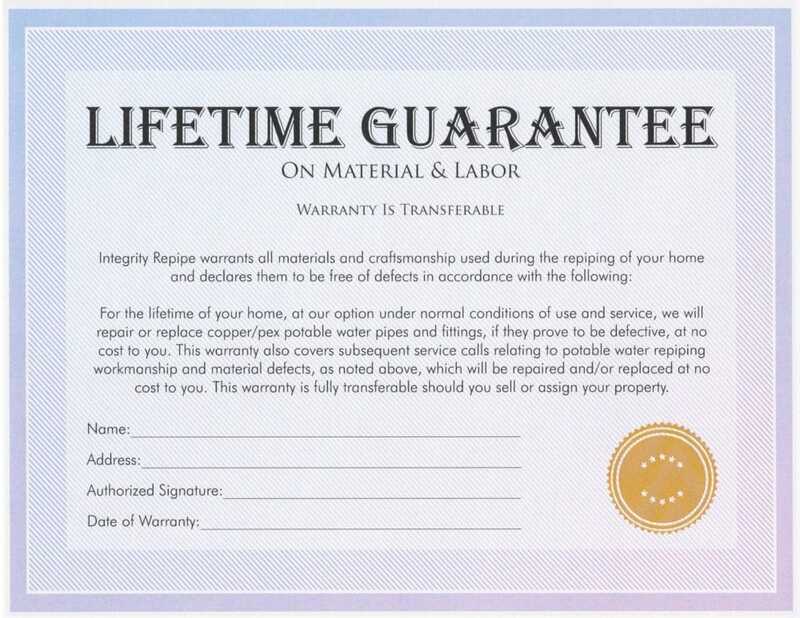 This warranty also covers subsequent service calls relating to potable water repiping workmanship and material defects, as noted above, which will be repaired and/or replaced at no cost to you. Add value to your home by having a modern water system installed This warranty is fully transferable should you sell or assign your property.